Sound the siren. It has been found. The perfect red dress. 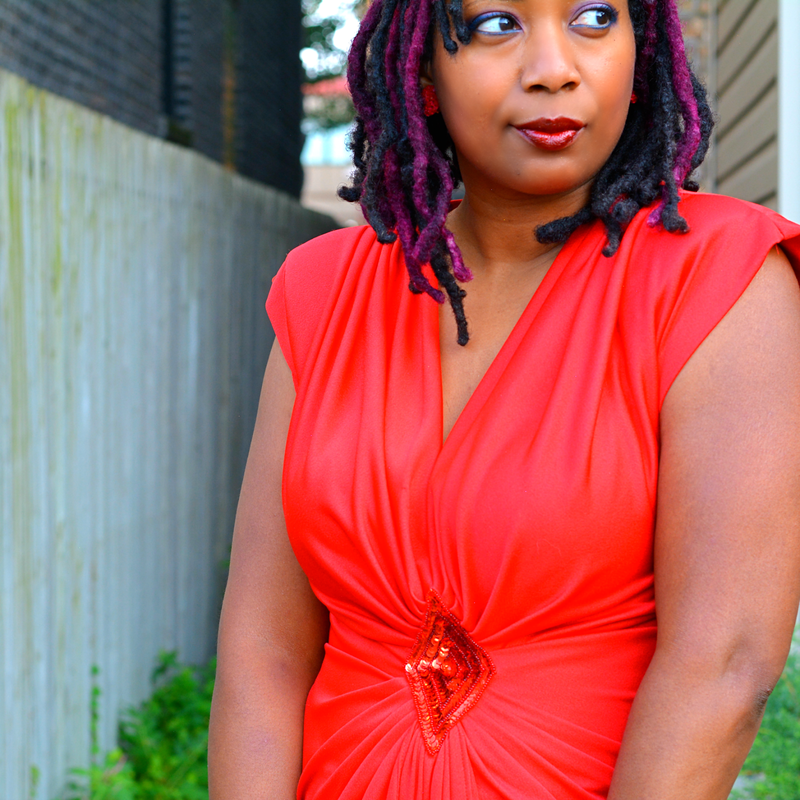 The perfect vintage red dress. I found myself with 30 free minutes before V's class ended, I decided to stroll into the nearby Village Discount. I looked through the "better garments" first and immediately spy a hint of sequins. I suffered mild sticker shock when I discovered they wanted $7.48 for this vintage poly dream. It's not a lot of money but I felt it was overpriced considering the quality. I bought it anyway because it spoke to me and my 10 pound weight lost. I'm super proud of the progress I've made and I like how this dress shows off my achievement. I can remember owning one other red dress in my life. A simple wrap that I got rid of because it wasn't very flattering. 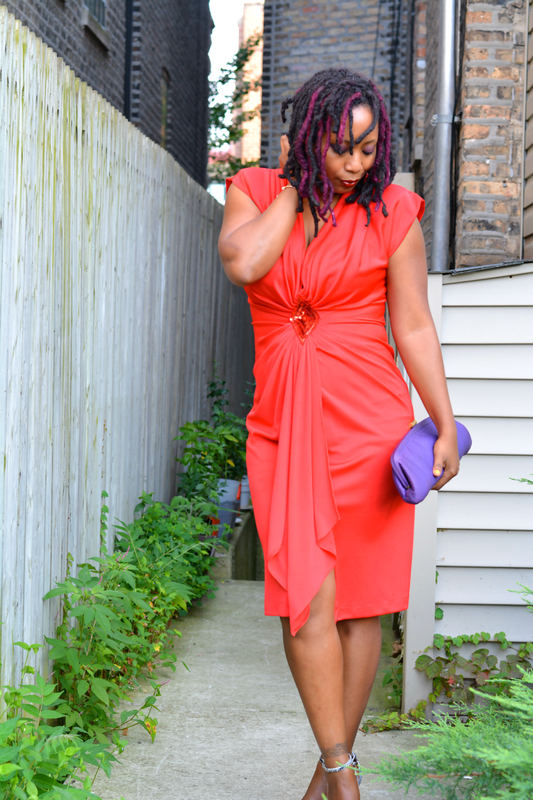 I've never really thought of red as a color I needed in my closet until I saw this dress. The color is vibrant. It has draping and ruching that are reminiscent of the 40s and a dash of 70s disco with plunging neckline and sequins. I'm undecided on the shoulder pads. I think they work with the dress. They are very large and don't hang quite right. Haven't decided to keep them or not. What say you? I was going out on the town with my birthday BFF -- a night that included a Chaka Khan concert and reggae club after. I wanted a simple yet edgy party look. Just a bangle for jewelry. 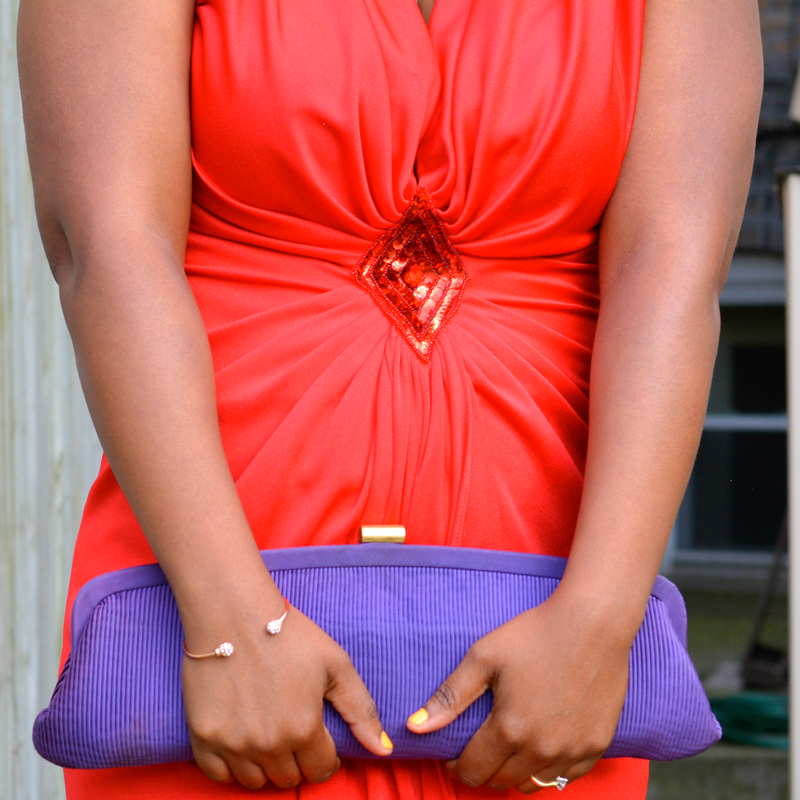 My clutch provided a bit of extra color to the mix because I can't just do red and black. I felt like a black bag would make the look completely dated. Walkable heels because my feet will complain otherwise. Do you have a little red dress? What makes it special? YESSSSSSSSSSSSS!!!! You weeeerked this outfit honey! I especially love that purple against the red. Stylish choice. Apparently my blogger logins are all messed up...but I love this dress...and I understand what you are saying about the price but it is ok. Your 10lb weight loss looks great! 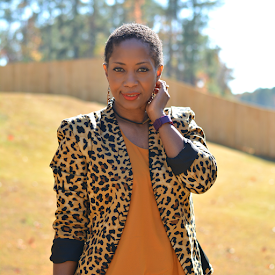 And in these photos I see no issue with the shoulder pads and I STILL have not been thrifting!! I think the color is fantastic on you. You are completely right, because of the vintage vibe a black clutch would make this look dated. The purple is fun and now. This dress looks great on you! Congrats on the weight loss! You look beautiful! 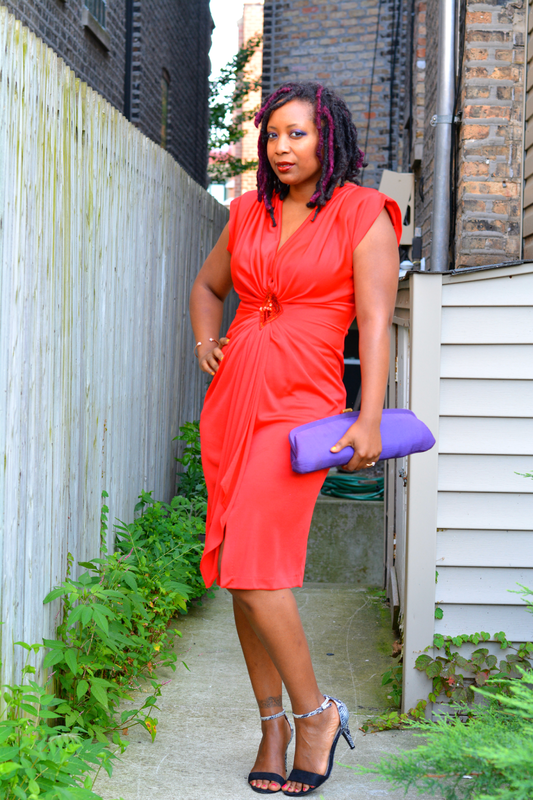 It's a beautiful red dress and great choice on purple for the clutch! 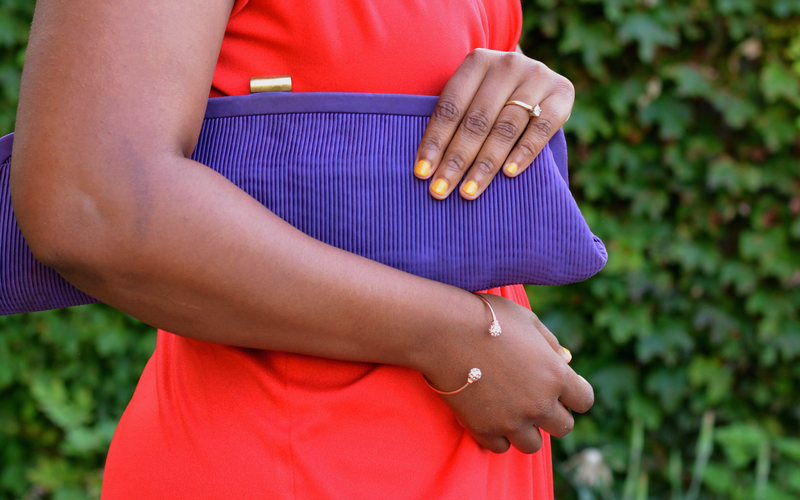 People will automatically (I would probably) reach out for the dependable black clutch. Regarding the shoulder pads, I'd remove it. It will look more updated without it unless you want it to look true to its time and leave them there. Congratulations on losing 10 lbs! Woohoo! I've been wanting to do that for the last 2 years LOL but I only have me to blame..